1/14/14 UPDATE: The Ohio Department of Transportation has delayed the work scheduled for January 14 to next week. It’s now expected to start at 9 a.m. January 20. 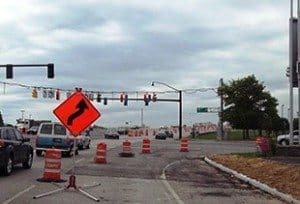 1/10/14 Ohio Department of Transportation announced today work to switch traffic onto new pavement and the newly constructed bridge on Eastgate Boulevard over State Route 32 will take place next week. From 9 a.m. to 6 p.m. Monday, January 13, 2014 lane closures will be in place on north and southbound Eastgate Boulevard over SR 32 to accommodate a traffic switch from the existing bridge to the new bridge and new pavement. Traffic will be maintained during the switch, but delays could be possible. Once work is complete, one lane of traffic in each direction will be in place along with a left turn lane to the ramp to eastbound SR 32. Southbound traffic will have access to one right turn lane into Best Buy, one thru lane and one left turn lane to southbound Eastgate. Northbound traffic will have dual left access into the mall, one thru lane and one right lane to Eastgate North (Frontage Road). In addition, demolition of the existing Eastgate Boulevard Bridge will take place next week. To accommodate that demolition, nightly lane closures will be in place on east and westbound SR 32 from 8 p.m. to 6 a.m., beginning Monday, January 13, 2014. Arrow boards and/or signs will be in place prior to the work zone to alert motorists of the upcoming lane closures. To help ensure the safety of the construction workers as well as the traveling public, motorists should remain alert, reduce their speed and watch for stopped traffic while passing through the work zone.